The Serúdla is a large semi-intelligent dragon-like creature found in the deep forests of Tékumel. The typical specimen is about 15' long, but they can grow up to 25' or even 35' in length. The creature has been dubbed "The Pale Murderer" by the peasantry, but they are not intrinsically hostile to humans. 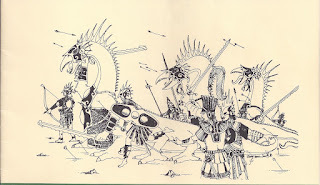 The tribes of the Ghatóni confederacy in Tékumel's north-west have discovered a method of training the Serúdla for use in war, and units of armored Serúdla are fielded by the Ghatóni. For some reason, I was under the impression that they were often encountered as mated pairs, but maybe I mixed them up with some other creature since I can't seem to find that reference in any of my Tékumel materials. No company has made a Serúdla in miniature (as of yet), but a kind reader graciously sent me a pair of Serúdla that he created using 3D printer technology. 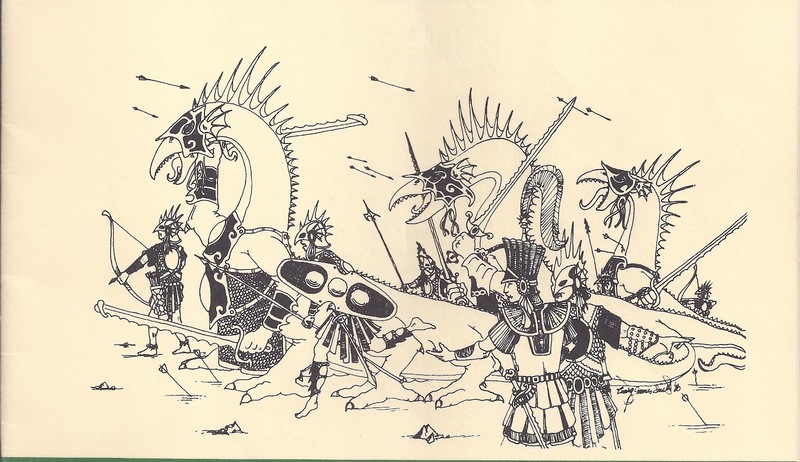 There are two versions of the Serúdla, an unarmored one (left), and an armored one (right). I particularly like the way the beaked appearance of Tékumeli creatures is faithfully captured by these models. I'm not sure what the proper term is, but there is definite "pixelation" on the models. For the Serúdla it looks nice, since it gives the appearance of fine scales to the creature, but I'm not sure how well the printing works if smoother surfaces are required. In 1/72, these Serúdla scale out to about 21' in length. The arms are on a separate sprue, and come with empty hands or holding swords. These particular models were made of a material called Nylon 12. It is fairly flexible, so delicate features like these claws can withstand some slight bending without breaking. Unfortunately some of the digits did break off, and after they were glued back on, they did in fact become prone to re-breaking. Next, I tried reposing some one of the hands using a hairdryer. Unlike plastic, Nylon 12 did not shrivel up under heat, and I was able to change the finger position of the model. It worked so well, I tried straightening out the armored Serúdla's tail with my heat gun. The tail was much thicker, and as usual I overdid things and ended up melting a couple of the left rear claws, which I had to recreate with Kneadatite. But other than my overzealousness with the heat gun, the tail was re-positioned without any problem. After figuring out how I was going to pose the arms, I assembled the miniatures. Nylon 12 is very porous, and soaks up CA glue like a sponge. Large smooth surfaces do not seem to adhere very well without pinning, but the ball joint on the arm and the socket were made with a bit of texture, which allowed the parts to be affixed. Next, I painted the miniatures. The acrylic paints seemed to soak right into the material as well. I tried to add a bit of opalescent sheen to the Serúdla with a wash of Ceramcoat Pearl Finish, but I was unable to capture the sheen by photography. I also cut some bases out of plastic card, and glued the models on to prevent the damaged claws from breaking off. I was really impressed with these models, and seeing them made me want to try my hand at creating some 3D models for rapid prototype printing. I hope that the Serúdla from The Tékumel Project will be as nice as these. The Tekumel Project's Serudla will be identical, but 10% larger and with reinforced toes. Unfortunately the pixelation you mention is unavoidable with the process used to make these models (Selective Laser Sintering)and tends to overwhelm fine detail on smaller subjects. Neat to see what you've done with these - I especially like the hair dryer bending technique. Also, what's the source of the temple in background of the finished shot? Nice to know these models will be used for the Tekumel Project Serudla. They deserve to be made available to the miniature gaming community. The temple is an aquarium piece I picked up at Petco. It is loosely based on what I assume is a Khmer temple at Ta Prohm. Fascinating - I'm currently on a CAD course with a fellow student who is building his own 3D printer using 2D vinyl cutter technology to build resin moulds a layer at a time. We had a bit of a debate about this on the HaT forum some years ago (now sadly deleted by H) and another on the Strelets forum and I've been following developments with interest. What with home transfer-printing and home laser-cutting one wonders if there will be any hobby stores left in the High Street or on-line soon?!! Dragons are really nice as well. Would you get the same surface detailing with the liquid sintering method? maybe it's not important at all, but since you mentioned it, the term is "voxelation", as far as i know. A voxel is a 3d pixel.